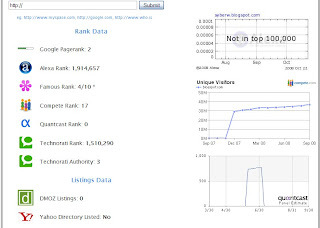 Dnfame is an online tool that offers you a free seo tool for check a website, you can find some information about a site, including: Pagerank, Alexa Rank, Compete Rank, Quantcast Rank, backlinks in the search engines, social bookmarking links, and more. It is simple but very useful! Just enter a website address, click Submit button. It will show you all information about that site.